It was a wet and windy scene at Longview Ranch when I took these pictures, but travel meant I couldn't publish until today for Bloom Day. Some of the regulars are back and holding tough against the elements, and a few seasonal changes brighten up the offerings this month. Like these crazy blooms; Fatsia japonica, with its perfect, sputnik-like blooms, was just made for the garden of a mid-century modern home. My mid-century modest house will have to do for this particular specimen. Also new this month are the welcome flowers of Camellia sasanqua 'Yuletide'. They seem a little early this year, but they will carry on for months if the weather doesn't stomp them. I see the ants are enjoying them, too. The blooms of Abutilon megapotamicum look to me like little Chinese lanterns hanging off the branch. The last, sopping wet trusses of Rosa 'Sally Holmes' are still hanging on. The big seasonal chop is coming to this plant soon. Also bedraggled, but still quite definitely blooming, is Erigeron glaucus, commonly known as seaside fleabane, beach aster, or seaside daisy. Well look: it's our old friend Daphne 'Eternal Fragrance'. There are certain species that I don't keep very good track of when I have a number of them. Heathers and heaths are two of those species, so I can't tell you what this autumn blooming heather is. I had to pull off a layer of fallen maple leaves even to see that it was blooming. It's rosemary bloom time. This is another species whose cultivar names I tend to be casual about, but I remember it was sold as Barbeque Rosemary. It's a compact, upright plant with clean, simple spears, perfect for skewering veggies when done carefully. Mahonia 'Soft Caress' was blooming for last month's Bloom Day, and although it's nearly done, it still adds a little bright yellow to the green scene. I'll leave you with the blooms of a NOID Schlumbergera. Their intense coral color is the perfect antidote to our wet, windy November weather. I'm joining in on Bloom Day, hosted on the 15th of the month by the lovely Carol Michel over at May Dreams Gardens. I am not a fan of our two Acer negundo 'Variegata' street trees. My biggest issue with them is the year-round rain of debris they produce, from samaras that just won't quit, to leaves that begin to fall in spring as soon as they are open, to brittle branches that scatter all over the front yard when they break. And sadly, they have been poorly pruned for years due to power lines that travel through their canopies. Although I would never recommend the species to anyone, I have to admit that our trees do have their positives: they are large, so they create good shade for our house in summer, and they provide a place for wildlife to flourish. And once in a while, one of those brittle, dead branches falls and is a source of exquisite beauty. The mosses and lichen on this branch create tiny gardens I can explore in detail. How do they manage to arrange themselves so perfectly? My thanks to Anna of Flutter and Hum for hosting Wednesday Vignette and reminding me to look a little more carefully at the world around me. October is not a flowery month around Longview Ranch. But a few seasonal offerings and some stalwart bloomers are brightening up little corners of the garden. For example, Impatiens omeana, blooming for the first time for me in the newer shade bed. The non-native Mahonia are blooming this month, too. First, there's M. fortunei 'Dan Hinkley'. 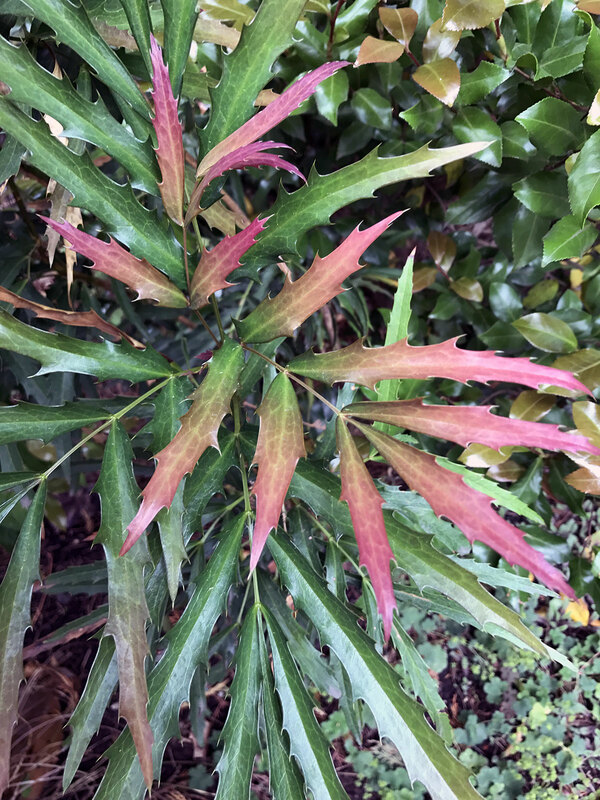 A newer addition to the garden is Mahonia 'Soft Caress'. I like this one a lot. M. gracilipes has very different (and almost impossible to photograph) flowers. These aren't quite open yet but they don't get much bigger than this. The tiny pink flowers of Cyclamen hederifolium 'Xera's Sterling' are perking up the Northwest Territory. One plant bloomed in the garden this year, and that compelled me to go out and get several more to add in the same location. Abutilon megapotamicum, still blooming strongly. Agastache 'Coronado Red', encouraged by our recent rains, put on a new flush of blooms. And it wouldn't be Bloom Day at Longview Ranch without our old friend Daphne 'Eternal Fragrance'. Check out other Bloom Day posts from all over at May Dreams Gardens. Here's a sight I haven't seen for months. Even if you didn't know this photo was taken this morning, you could probably guess we are no longer in high summer here in Portland. Yesterday afternoon I dumped an two-day accumulation of .7 inches of rain out of my rain gauge. Then this morning I emptied just over an inch! Do you see how the dirt (ash, dust, pollen, whatever) has coalesced under each drop of water below? That shows you that things were getting a bit grimy over summer, and how welcome the rain is for cleansing the air and the plants. But as much as my garden needs it, I hope the rains will not be constant from now until June; I need a little transition time to make my peace with autumn and winter. And I have plants that, after waiting seemingly for months, I can finally put in the ground. Each month when I wander in the garden looking for Bloom Day flowers, I'm reminded yet again that I don't really have a "flower garden". In fact, I just reviewed a Bloom Day post from two years ago to discover that I have almost the same set of flowers - hmmm. 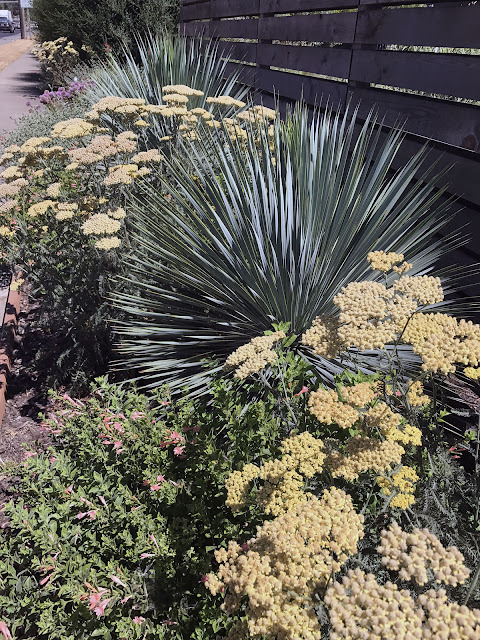 But there are the August stalwarts, so here's a brief recap of what's blooming at Longview Ranch on this 15th of September, starting with the late-summer flowers of Helianthus maximiliani. I have to wait all summer for these bright faces. California poppies (Eschscholzia californica) self-seed each year. This year they have lots of room where the big Ceanothus used to be. The tiny flowers of Berberis verruculosa are almost unnoticeable, unless, like me, you are searching for blooms. In nice timing for the overwintering humming birds, Mahonia fortunei 'Dan Hinkley' is beginning its flush of flowers. With more room to grow, Solidago 'Lemon Baby' has exploded this year. After dying to the ground over winter, Sphearalcea 'Newleaze Coral' has bounced back this summer. A new Punica granatum 'Nana' has put on lots of growth, and flowers, since I bought it a few months ago. My neighbor's Campsis radicans is still going strong and delighting me. Lagerstroemia 'Natchez' is on its last few flower trusses. A surprise white Foxglove popped up in the Northwest Territory. I figured it out: this cultivar of Daphne x transatlantica is called 'Eternal Fragrance' because it never stops blooming. Hardy Cyclamen emerge from the dusty dry rocks. I don't know how they do it. 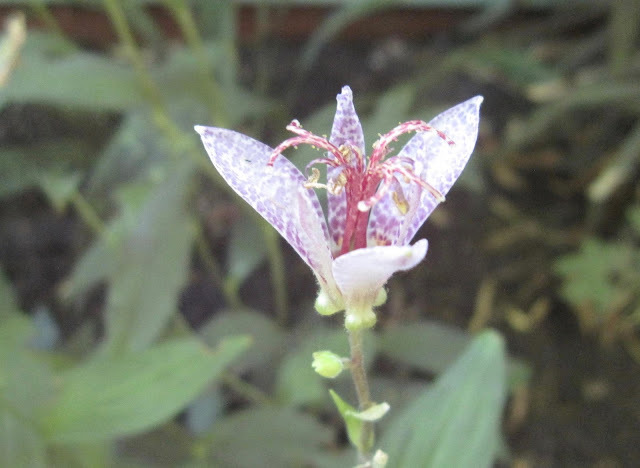 Tricyrtis formosana var grandiflora 'Wa-ho-ping Toad'. Not really "whopping" but very welcome in the shady bed. They're almost over, but the little, papery blue blossoms of Limonium speciosum 'Blue Diamond' make me happy. The sweet blue blossoms of a prostrate Rosemary. Rosemary usually blooms in early winter around here, but it's been an odd year. Surprise fall blooms on Loropetalum chinense 'Sizzling Pink', as well. Silene dioica 'Ray's Golden' is pumping out more flowers this month. Lastly, Erigeron glaucus won't say goodbye to summer yet. And neither will I. See all the flowers from all over today courtesy of Carol at May Dreams Gardens. Fall Plant Fest is coming right up! But wait - there's a fabulous Fall version happening on September 16th, called Fall PlantFest! And it's not just about getting cool plants into your grubby little hands. This year's speaker is none other than Sean Hogan of Cistus Nursery, who will present "Sean's Top 40" (he's talking plants, not music, of course.) 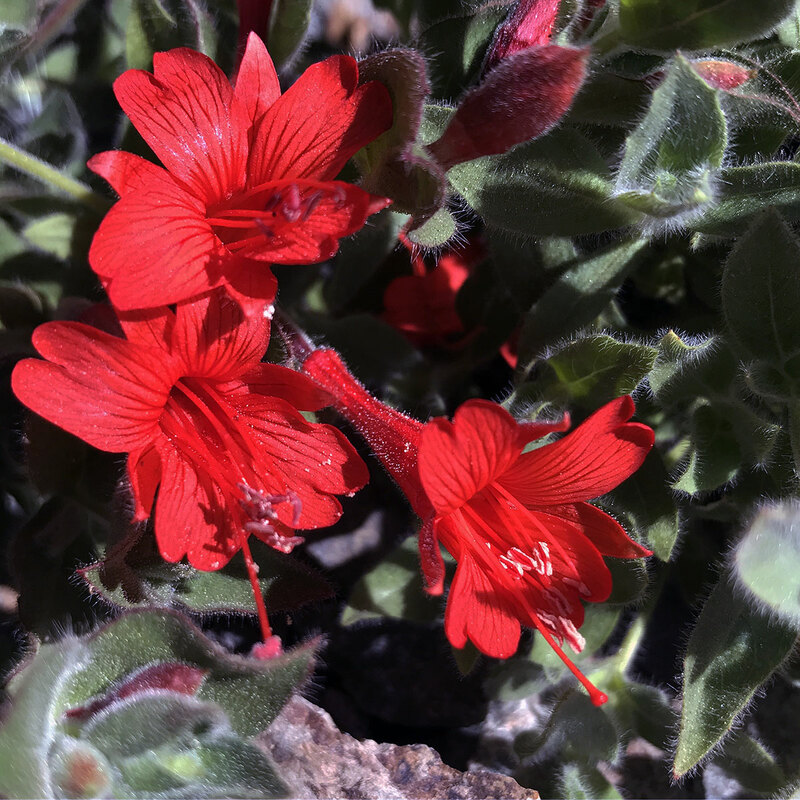 Sean has a passion for plants and you'll hear about plants from the West coast to Mediterranean settings to woodlands to lush tropical areas. 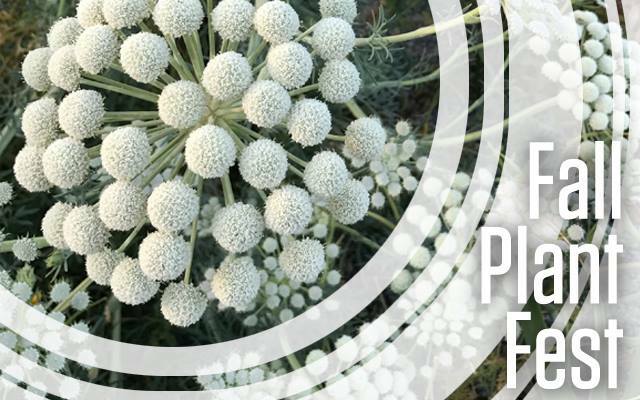 Multiple specialty vendors will be on hand, with many plants that can only be seen and purchased in the fall, including fall and winter bulbs, perennials, shrubs, plants for winter interest, and varieties that will perform well in our gardens next year. There's also a botanical display and book sales, and Sean has promised to bring lots of door prizes! The whole shebang happens on Saturday, September 16, with the lecture beginning at 10am, followed by the plant sale from 11am to 2pm. It's at the PCC Rock Creek Campus, 17705 NW Springville Rd, Portland, OR. Admission to the lecture is $10 for HPSO members and $20 for non-members. The plant sale is free to the public.